The Church of the Latter Day Saints, more commonly referred to as “Mormons” outside the church, have a great deal of connections to Freemasonry, though many are not well known even to many Masons or Mormons. The first Prophet of the Church, the founder, Joseph Smith, basically took the Masonic rituals of initiation, adapted, altered and adopted them as the Mormon Temple rituals including the “Endowment” ceremony. Without certain of these “covenants” and ceremonies, it was believed you couldn’t reach the “highest levels” of heaven after death. Joseph Smith himself was the son of Joseph Smith, Sr. who had some apparent occult predilection. The brother of the founder of LDS was Hyrum Smith. Hiram Abiff, by the way, is an important figure in the legend and lore of Masonic history. Joseph Sr. supposedly practiced the art of “money digging” which was similar to dowsing for water and involved doing certain ceremonies and rituals beforehand. It was supposedly during one of these “money digging” sessions that Joseph Smith himself discovered the seer-stone that allowed him to find and read the supposed plates that became the foundational documents of Mormonism, all this is mentioned in the History of the Church which, along with the Covenants and Doctrine, Pearl of Great Price and Book of Mormon are of a similar importance to Mormons as the Bible itself. Both Brigham Young and Joseph Smith were known to wear mystic amulets for protection and power. Secretly Joseph Smith wore the Jupiter Talisman (believed to confer power, protection, favor, riches and love) until the day he died when it was found in his pocket. Brigham Young similarly wore a bloodstone secretly daily. The first 5 prophets of the Mormon church were all Master Masons. Salt Lake City itself is filled with Masonic symbols, as a result of the Masonic influence on LDS. As a result, until the 1980’s Utah Lodges didn’t allow LDS members and even prohibited Mormons from other states to visit their lodges. Part of this was due to the claim that Joseph Smith had not only stolen but revealed some of the secrets of Freemasonry. Ritual ablution, special garments, receipt of new names, oaths, ritual doctrine explained through drama, the sun, moon and stars being used as key signs and symbols are present in occult traditions and Freemasonry but are also central tenets to Mormonism. Even the discovery of the golden plate in an arched stone vault marked with pillars is a reworking of the Enoch myth of Royal Arch Freemasonry according to author John Brooke in his book Refiner’s Fire: The Making of Mormon Cosmology. Enoch is an important figure in the Mormon cosmology. The artifacts of Mormonism such as the thurim and Sword of Laban all bear Masonic symbols as well. According to the History of the Church, Joseph Smith became a brother at a Lodge in Nauvoo, Illinois in March of 1842. Supposedly the next day he was “exalted” to the degree of sublime by the very next day. Dr. Reed C. Durham was one of the first Mormons to seriously study the Masonic past and inspiration for the LDS church. He wrote of how the anointing and coronation of the King and Endowment ceremony in the temple were altered rites from Freemasonry. Dr. Durham also noted the language such as ancient orders, examination, degrees, candidates, secrets, lodges, rules, signs, tokens, the order of the Priesthood and keys, made it obvious that there were powerful “Masonic overtones” involved in the formulation of the LDS religion. LDS involves certain “covenants” that the offer status and capacities of Godhood in the next life. Some Mormons have pointed out how in the late 2nd century, Christian philosophers Erinaeus and Clement of Leon seem to point to how man may become “as God.” Like Freemasonry, some of the covenants are considered oaths that imply certain responsibility. “The ordinances of the endowment embody certain obligations,” mirrors somewhat the oaths and obligations of the Masonic candidate once he is initiated. Other symbols found on the Church History Museum in SLC (erected in 1984) include inverted pyramids, the downturned pentagram that is most often associated with Satanism but is also found in Masonry. In addition to all this, an Alpha and Omega symbol under which is a picture of a handshake or, more specifically, a “hand-grip” Shibboleth, the pass grip of a Fellow Craft. The All-seeing Eye and even the use of aprons are common to Masons and Mormons. In the case of Temple ceremonies, the blue and white apron lodges are replaced with a simple field of green. As for the idea of “degrees” to get to the highest level of Heaven, a Mason must not only attend church but be accepted to the Temple and also receive a Temple recommendation. At each level new “hand-grips” or “tokens” are learned. Supposedly after death, these grips and handshakes must be used in order to penetrate the innermost and highest levels of the Afterlife where man will be a God of a sort himself. In Freemasonry there are “blood oaths” related to the obligations and covenants that involve the tongue being cut out, buried in the sands up to the level of your neck at low tide, having the heart cut out and (at the third degree) having your entrails cut out and burned. At least once these oaths were enacted. Captain William Morgan wrote a book in 1827 revealing the secrets of Masonic rituals and was murdered as a result. This led to a drastic change in public sentiment towards Freemasonry, but in the 1840’s in Palmyra, New York lodges were everpresent and still quite popular. Some theorize that Smith’s death was less about a mob angry at the rampant polygamy and was more about Smith stealing and using the secrets of Masonry. The Mormon publication Times and seasons reported the story of Smith’s death thusly: "…with uplifted hands they gave such SIGNS OF DISTRESS as would have commanded the interposition and benevolence of Savages or Pagans. They were both MASONS in good standing. Ye brethren of 'the mystic tie' what think ye! Where is our good MASTER Joseph and Hyrum? Is there a pagan, heathen, or savage nation on the globe that would not be moved on this great occasion, as the trees of the forest are moved by a mighty wind? Joseph’s last exclamation was 'O LORD MY GOD!'" 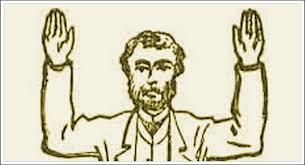 “O Lord My God” and other signs that some witnesses attested too are Masonic hailing signs of a brother in distress. That said, would a fellow brother of the Craft still feel obligated to one who had supposedly earned a death as in the case of Captain Morgan? Freemasons are the Glue that Holds America Together as a Democraic Society, Free Masons and York Masons are why we are not living in Nazi America, we still have a Constitution, a Constutition WRITTEN by Freemasons. Every Founder Father 1776 was Freemasons. Sadly, inadvisable brain, you are incredulously filled with misinformation. Masons are satanic. You obviously must not be terribly high on their totem pole otherwise you would know this. Masons / Morons are disguised as God fearing folk when history suggests otherwise. I am sorry for your pathetic ignorance.